So, I guess the upside to me writing a blog about charity projects includes me being able to write up my own charity event, well kind of, one that I am organizing with the lovely Natascha Mirosch. For the past five years, I have hosted a small-ish charity dinner in the month of October, each time supporting a different and little grass roots cancer related charity. This year Natascha and I have chosen Mummy’s Wish: supporting mums diagnosed with cancer. The formula is simple really. I invite friends, friends of friends and complete strangers to come along have a fun night and raise a bit of cash for a small charity doing great things. To date, this little dinner has raised over $15,000. 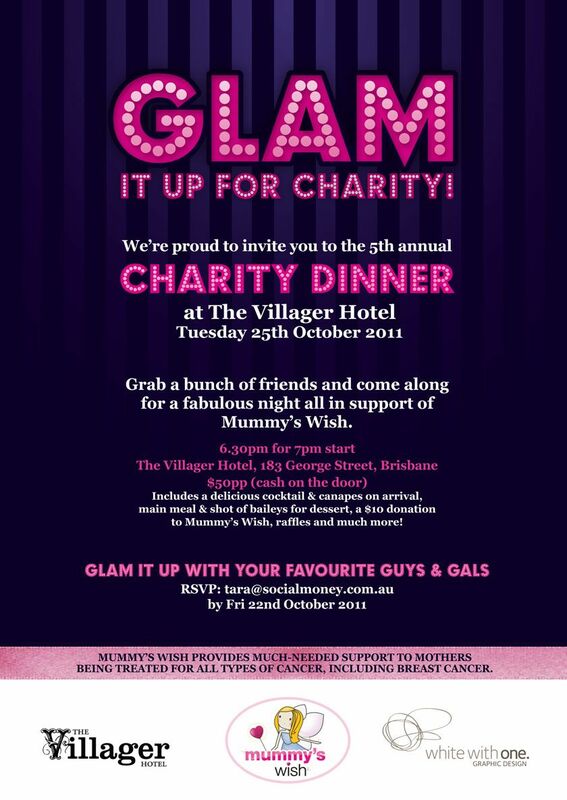 This entry was posted in Community, Mummy's Wish and tagged Brisbane Events, Charity Dinner, GLAM it up for charity, Michelle Janssen, Mummy's Wish, Mummys Wish, Natascha Mirosch, Tara Castle, The Villager Hotel. Bookmark the permalink. hahaha I can’t believe you included me in the Dress section. Hilarious.